Uglyworld #1811 - It's Not Jealousers - (Project Cinko Time - Image 21-365), a photo by www.bazpics.com on Flickr. After sharerings yesterdays photomagraph of me standerings with the 2013 calendars of Baz in fronts of me with a photomagraph of Wage includereds there was discussions if I was jealousers. 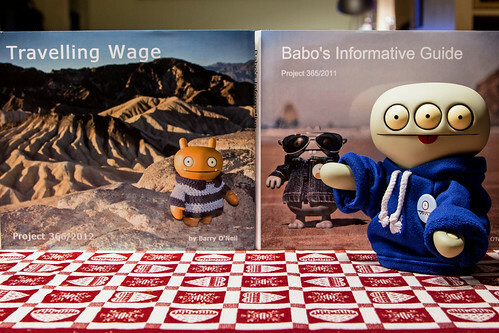 I personallies doesn't thinks I is jealousers, I thinks it is mores the case that I has so much to livers up to afters my gooders buddies Babo and Wage, as they both is so super mega famousers that they has books made of all the adventures and funs they gettereds up to! At the ends of the days, I supposers that I just needs to uses the books and calendars to inspires me to be even more coolers than normallers, so that when people has the choicers of all 3 books to picks up, that they picks mine! Time to ups my gamer I thinks!